Black reel with lobster-claw hook on one end and a J hook on the other. 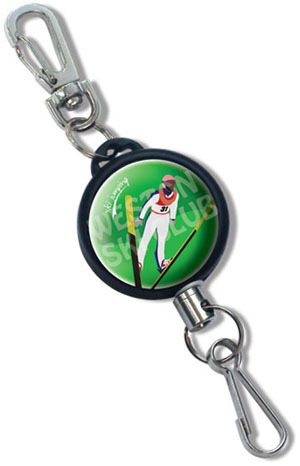 Attach to any jacket and annual ski pass. Can be custom printed. PHOTO SHOWS CUSTOM LABEL WHICH IS NOT INCLUDED IN THIS PRICE. Minimum order = 100 pieces. Please order in multiples of 100.